The Color imageRUNNER C3480i model is a full color digital multifunctional solution that offers Canon's advanced imageCHIP system architecture capabilities for exceptional quality and performance. This model operates at up to 34 ppm (letter) for black-and-white output and up to 30 ppm (letter) for color output. This model packs a great deal of productivity and technology into a convenient, compact design. Offering digital copying and Mail Box features, standard Color Universal Send and printing, and a choice of robust finishing options, the Canon Color imageRUNNER C3480i model delivers smart color in the office! 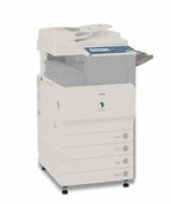 The Color imageRUNNER C3480i model is designed for general office environments and is bundled with features that provide out-of-the-box business productivity for office application users who frequently send color documents. The Color imageRUNNER C3480i model is powered by Canon's evolutionary imageCHIP system architecture. It not only enables simultaneous copying, printing, scanning, sending and faxing, it also delivers output at speeds of up to 34 ppm (letter), respectively, in monochrome and up to 30 ppm (letter), respectively, in brilliant color. The Color imageRUNNER model packs a great deal of productivity and technology into a convenient compact design. The Color Rapid Fusing System allows for short warm-up times and quick first-copy-out-times. And with up to 1200 dpi, the Color imageRUNNER model can address more sophisticated document production needs. The Color imageRUNNER system supports a wide variety of media including heavy paper, labels, envelopes and transparencies. The model offers an optional internal finisher that can corner or double-staple multi-page documents without increasing the footprint of the device. Customers also have a choice of two external finishers that provide extensive stacking capabilities, multi-position stapling, saddle-stitched booklet output, and optional hole punching for professional-looking output. Flexibility to accommodate all job types on one machine. Canon's proprietary UFR II printing technology as well as PCL printing is standard on every model. That means every Color imageRUNNER system is a true MFP right out of the box, ready to produce volumes of general business documents. This device can also be equipped with the PS Printer Kit-Q3 to add PostScript 3 emulation printing capabilities.